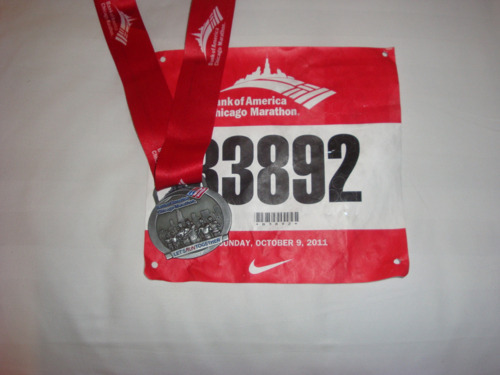 My Run: Overall, the 2011 Bank of American Chicago Marathon was my ninth full marathon. 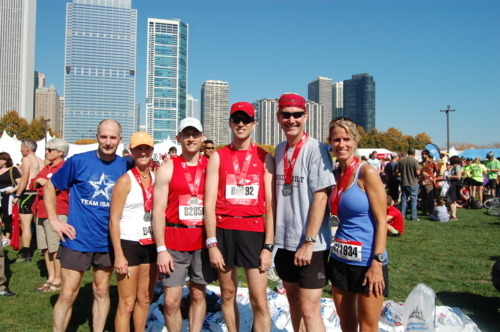 Chicago was also the site of my first marathon back in 2009. There was no secret that my goal coming into this race was to break 3:15 for the first time. 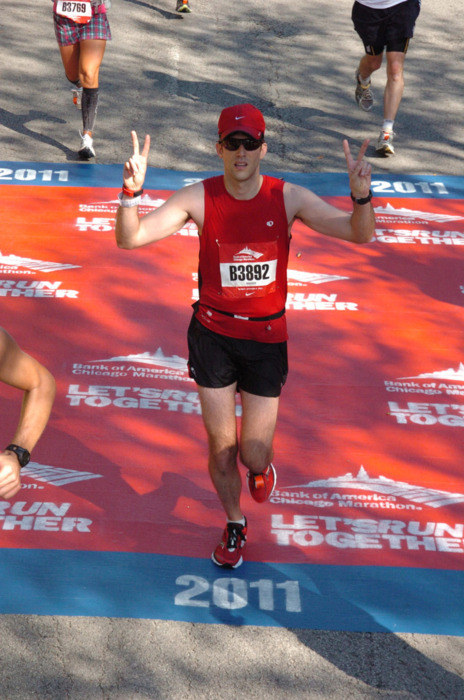 I had set my current PR of 3:24 at the Rock n’ Roll San Antonio Marathon in November 2011. Just before this I tried to break 3:15 at the Medtronic Twin Cities Marathon in October, and was able to hold that pace for 22-miles before hitting the wall hard and finishing with a 3:25. Everything in my training program, which started on July 4th, was aimed at this goal. I reduced the amount of time I spent doing cardio-based cross training, and spent that time instead on putting in extra miles on the road or trails. I added trail running and barefoot running to my schedule to improve strength, and was diligent about doing tempo runs and marathon pace workouts around this goal pace. My training throughout the summer went extremely well, and I felt ready to break 3:15. The one thing that I could not control was the weather. 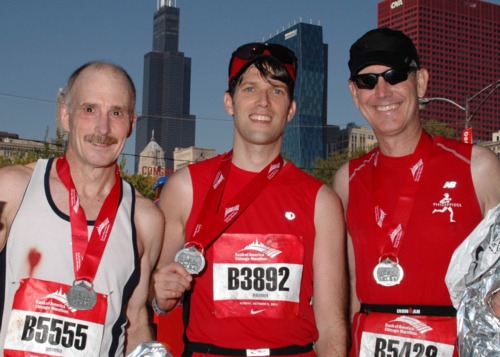 When I ran Chicago back in 2009, the temps were in the 30s and 40s during the race, but this year it was 65 at the start and nearing 80 when I finished (with full sun). While this is not oppressive heat when compared to what we run through in Tennessee during the summer, it is way higher than what is ideal for a race of this distance. Also, Middle Tennessee had seen morning temps in the 40s and 50s for the past two weeks, so this made it even more difficult to adapt. We all knew what the temps were expected to be going into race day, but I decided I was still going to give 3:15 a shot. My plan was to run a slightly conservative pace for the first 15 to 18 miles, and then take inventory and see if I could push it the rest of the way. On race morning, everything went according to plan. This included my pre-race meal, hydration, warmup, etc. My legs felt really good with no soreness or pains. I ran easy for just over a mile with Nathan and Paxton, and then did a few short bursts in the corral to get my heart ready for race pace. When the gun went off and we crossed the start line, it was really hard to find a pace groove because of the size of the field (45,000 registered runners), I knew I was running slower than race pace, but didn’t stress about it because I wanted to be conservative. I did notice that the air felt a bit humid, which surprised me. The race started about 30 minutes after daybreak, so the morning moisture had not yet burned off with the sun. This continued for about the first 5 miles or so, before the air began to feel dry. Also, most of the functions of my Garmin 405 were completely useless during the race. Immediately after starting on Columbus Avenue, the route goes through a 1/2 mile tunnel, so my watch could not maintain a satellite signal. When I came out of the tunnel, my Garmin lapped at a mile which it showed as 5:00 pace. I tried to reset the laps at the first mile marker on the course, but I had trouble with satellite signals all day running among the skyscrapers downtown. I stopped worrying about the pace calculations on the watch and instead used the elapsed time along with my 3:15 pace band. When I came to the first mile marker I was about 20 seconds behind goal pace, and the participants were still thick on the course. They were so thick that we basically came to a stop whenever the course turned. It was this way through the first 3-miles downtown and then it began to thin out as we headed north on LaSalle. I knew that my wife Olivia was going to try and be on the course around 3.5 miles, but unfortunately the road split up LaSalle, and she was on the opposite side from where I was running. As the course continued northward through Lincoln Park up to Addison (Mile 8), I felt pretty good, but not great. The heat was definitely bothering me, though I was still able to maintain a decent pace. At each split for the first 8 miles, I was hovering around 30 seconds behind 3:15 pace, but this was exactly what I wanted. When the course turned south back toward the Loop, I began feeling better. 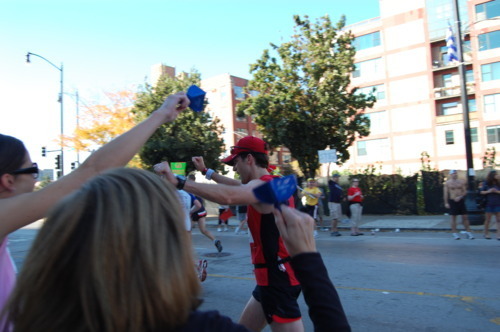 During mile 10 the volunteers were spraying water on the runners and passing out cold water sponges, which were AWESOME. By mile 11 I was feeling fantastic and strong, and my pace deficit had dropped to just 12 seconds behind goal. Olivia had planned to meet me on the course at 11.5, so I started running near the side of the road trying to see her. All of a sudden I saw her as she stepped one foot out in front of me, and I stopped briefly, planted a big kiss on her, and then kept going. In the middle of the kiss I heard the guy next to her say “Nice!” This was by far the highlight of my race, and gave me a big boost all the way to the halfway mark. When we reached the Loop downtown, the crowd was overwhelming and the noise was deafening. I was feeling fantastic as we headed west to the halfway mark at 13.1, and my pace deficit was now at only 8 seconds. Unlike the northern part of the course and the Loop downtown, the western route offered very little shade, and the heat began to get me again. I could start to feel my pulse pounding in my face and my legs began to get heavy as we finished miles 14 through 16. Volunteers were spraying water at every aid station now, and I always let them douse me to try and control my heart rate. For mile 17, the course briefly came back into the Loop, and some much needed shade. Also during mile 17 I saw Susan, Sallie, Janna, and Candy from our group cheering, which gave me another boost. As the course headed toward the south side of Chicago, we were back in full sun again and things began to break down. By mile marker 18, I was around 45 seconds behind goal pace, and was starting to feel pretty bad. I could again feel the heat pounding in my face, my heart rate was high, and my legs were really fatigued. 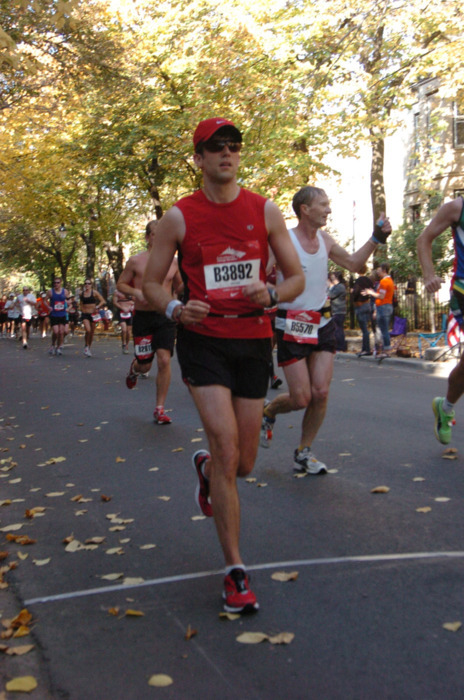 I began to realize that if I continued to push through at goal pace, it was very likely I would not be able to finish. After some quick calculations I figured out that I could still break my existing PR of 3:24 if I maintained at least an 8:30 average pace for the rest of the way. Knowing that 3:15 was just not going to happen with the temperatures continuing to rise, I ran the remainder of the race with this goal at the forefront of my mind. I tried to stay in the moment, but it became increasingly difficult with my body breaking down. For the final 8.2 miles after my change in goal, my body was screaming for me to stop and walk, but I just tried to keep putting one foot in front of the other. I never stopped, even at an aid station. Even though the fatigue was overwhelming at times, I never bonked (hit the wall). It is hard to describe the experience of bonking to someone who has never been through it, but this was not what was happening. What I was feeling was simply good old-fashioned fatigue from the intense effort and warm temperatures. During this stretch my pace only went above 8:30 (8:46) for one mile, and most of the rest were between 8:00 and 8:25. I got a boost with the crowds through Little Village at mile 20, where there was also another station of volunteers handing out cold water sponges. At every aid station now I was not only allowing the volunteers to spray me, but was also dumping several cups of water over my head in an attempt to keep my heart rate down. I also got a boost through Chinatown at mile 22, and on State Street and Michigan Avenue at mile 23. The crowds in these areas were awesome. Olivia was watching for me on the course during mile 23, but I was so focused on keeping my feet moving that I never saw her. 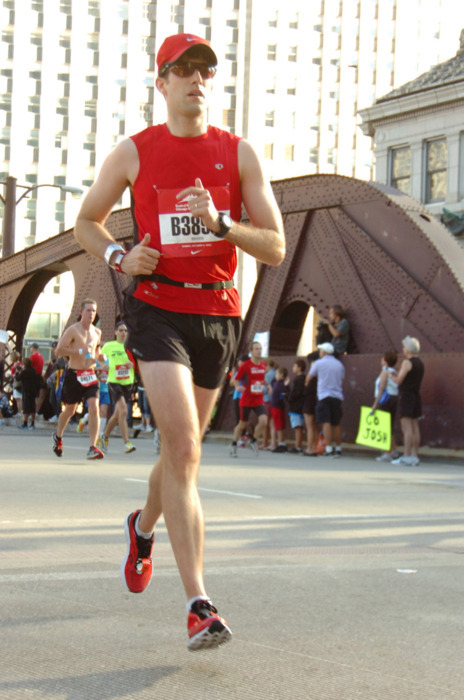 As we moved north on Michigan Ave. toward the finish, I began to think that someone from my group was going to catch me. I figured the most likely ones would be Sue Anne, Marc, Nathan, or Paxton who each had finish-time goals between 3:20 and 3:25. Somewhere around mile 24 I heard a voice behind me yell “How are you feeling?” This briefly startled me, but I turned around to see Sue Anne looking strong. I quickly answered “Awful, how about you?” She replied “Awful,” and then gave me several words of encouragement and blew past me. It did not surprise me at all to see Sue Anne, because she is such a strong runner. Just two weeks before Chicago, she had finished 2nd overall at the Women’s Half Marathon in Nashville. I really appreciated her encouragement. Through the final 1.2-miles the crowd was ridiculously LOUD and AWESOME, and this gave me the push I needed to drop down below 8-minute pace for the finish. I let go of everything I had left as I climbed the hill heading back into Grant Park and powered toward the finish line. My mind was still alert and focused, but everything else in my body was SCREAMING! I crossed the finish line with a time of 3:22:28, a new PR by almost 2-minutes on a tough day. I was overwhelmed by relief as I slowed to a stop, and then excited when I looked at my watch and saw that I had set a new PR. At no point since the finish have I felt disappointment with not making my goal of 3:15. I’m disappointed with the weather conditions, but know that I did the best I could with the circumstances of the day. 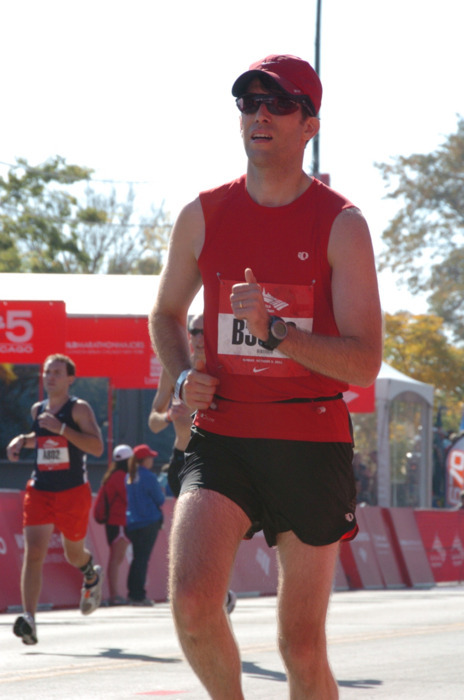 When I think back to the Twin Cities Marathon last October when I tried to break 3:15, and also fell short, I remember coming out of that race pretty confident that I was not yet at the level to run a 3:15. The weather conditions were perfect, my training was good, my nutrition plan was spot on, and I still fell short. This time, I come out of Chicago confident that I CAN run a 3:15 marathon (or faster) given the right circumstances and the right course. For now, I’ll gladly take a 2-minute PR in less than ideal circumstances and set my sights on 3:15 again at the Rocket City Marathon in December. 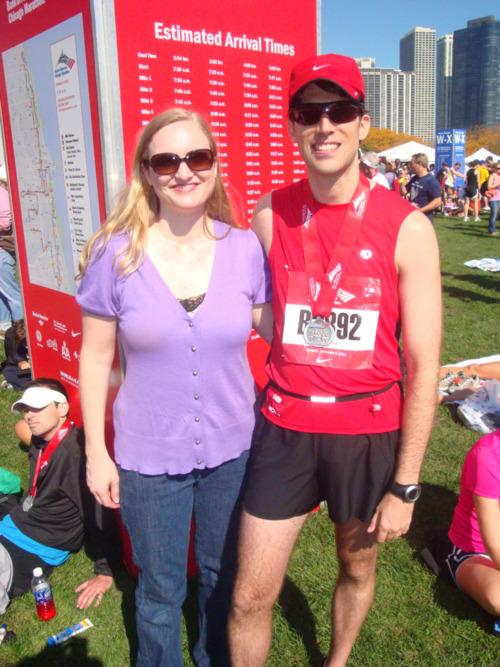 Olivia – This race had to be a whirlwind of emotions for my beautiful wife. 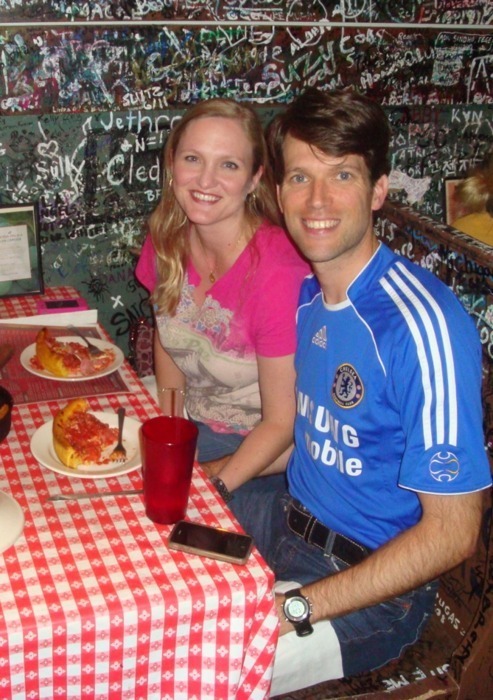 Chicago was supposed to be her first full marathon after completing 7 half marathons. Back in the summer she was diagnosed with bi-lateral tibial stress fractures, and was only released back to light training the week before the race. I know this made it difficult for her to be there because of her disappointment, but she came anyway to support me, and spent the whole day riding the El trying to see me at various places along the course. This meant a LOT to me, and as I mentioned earlier seeing her at mile 11 was the highlight of my race. With Olivia after the finish. Then when the race was over, we had an awesome day together on Monday enjoying one of our favorite cities. My wife is AWESOME! 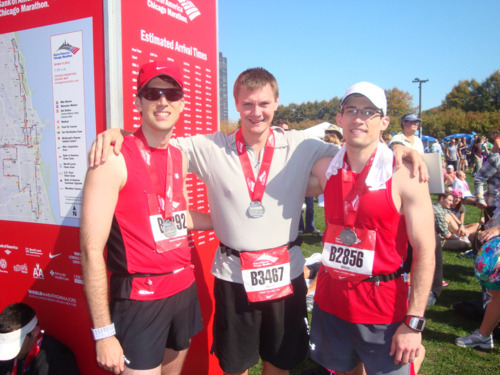 Nathan and Paxton (The Bellevue Trio) – This was not the first race trip that I’ve taken with my dear friends, but it is the first full marathon we’ve participated in together. On any given week, I usually run with one or both of these guys for 4 or more days. We’ve spent a LOT of time together, and I enjoy every moment. 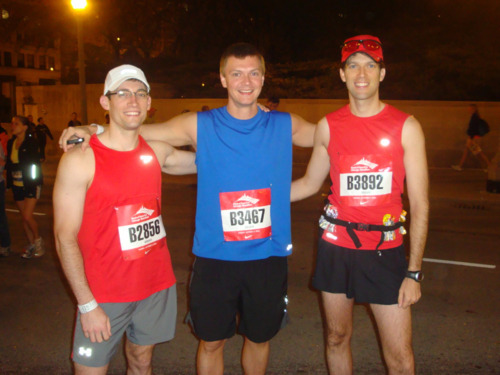 I could say a lot about what these guys did for my training or helping me towards Chicago, but what I really appreciate is just having two good friends to enjoy running with.None of the three of us met our pre-race goals, but all of us finished the race in tough conditions. Paxton even had to deal with cramps, foot pain, and side pain, but still pushed through to the finish. I’m really proud of these guys. On a side note, It was great to meet Nathan’s parents for the first time. It was also awesome to join Nathan, his wife and daughter, and his parents for an informal time of worship in their hotel room after the race. Dan and Marc – Very shortly after I finished the race, Marc came up behind me in the finish area and we were able to spend quite a while talking about the race while waiting for others finish. A few minutes later, we saw Dan and the three of us slowly walked from the finish area to the meet up area while continuing to share stories from the race. I’m sure they don’t know this, but that was really special to me. I look up to Dan and Marc a lot, and to be able to share experiences after a race where we all participated was quite a treat. Marc has been encouraging to me from the first time I ran with the group. I remember that first run very well. It was the 16.5 loop in PW and EW parks in the Summer of 2009, and I was nowhere near fast enough to keep up with the group. Even though I kept telling them to go on without me, Marc would run back to me and then run slowly with me. From that first day he told me how much potential I had if I kept training, and he didn’t know me from Adam. That encouragement has continued ever since, and it has been a pleasure getting to know Marc and his family. We were having dinner with the group after the race and just as Olivia and I were leaving, Marc got everyone’s attention and said that everyone needed to congratulate me on achieving a new PR in tough conditions. This meant a lot to me, especially considering that many of the people in our group have faster PRs than me, yet they still made a big deal for mine. Dan has been instrumental in the progress of my training and capabilities over the past three years. He has more running knowledge and experience in his little finger than I have in my whole body. 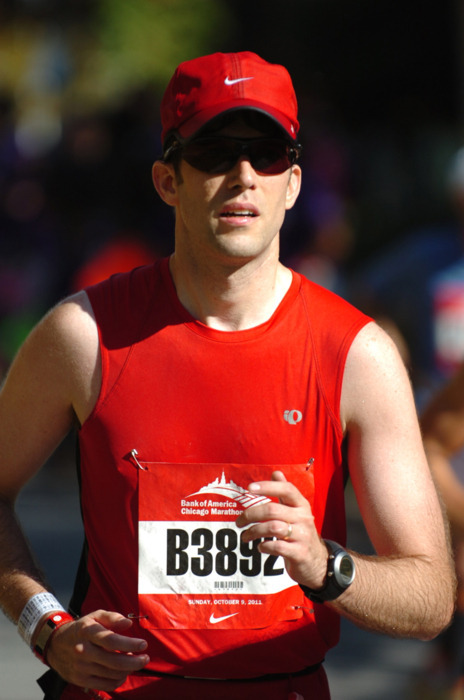 During the summers since I’ve joined the group, Dan has designed our bi-weekly marathon workouts in preparation for our fall marathons. These workouts have turbo-charged my progress, and have also given me a lot of confidence. There was one particular workout this summer that my mind kept drifting to throughout the final miles of the race. It was an awesome workout which was designed to simulate the fatigue at the end of a marathon. Knowing that I had finished this workout strong told me that I could finish the marathon even though I wanted to stop. I told Dan this as we were walking back, and I am very fortunate to have been able to train with him for the past 3 years. Susan and Sallie – Susan and Sallie were the other two members of the group who were unable to participate in the race due to stress fractures. In spite of this, they still came up and cheered us on from sidelines. I’m sure the disappointment must have been tremendous, but I really appreciate them being there. When I saw Susan and Sallie at mile 17 I got such a boost of adrenaline that I threw my arms up in the air like I finished the race. For Susan, this makes two consecutive fall marathons she has missed with stress fractures, in addition to missing her first chance to run Boston in 2010 due to her daughter Isabel being diagnosed with Leukemia. To go through all of that, and still travel to Chicago to cheer us on is unbelievable. All-in-all this was a great trip to share with my wife and great friends! 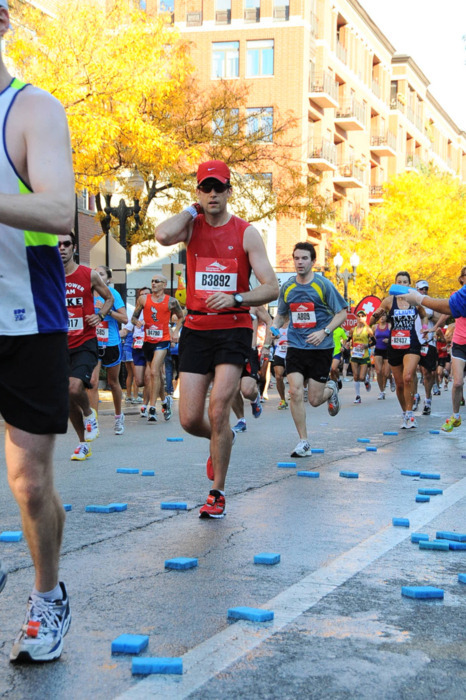 The Race: The Bank of America Chicago Marathon is one of the 5 “World Marathon Majors,” so obviously this is “Big Time” when it comes to races. It is hard to find too many things to be critical of in this great event. If there are any weaknesses at all I would point to the participant t-shirt which is cheap and flimsy (cool design), the boring finisher’s medal, and perhaps the course congestion in the first few miles. However, these things are pretty minor, and I’m willing to deal with the course congestion to be able to participate in a big time race. Some might point to the unpredictable weather, but who would think that October in Chicago would produce hot conditions for 3 of the last 5 years? There were 20 aid stations on the course, and all had water and Gatorade. The Gatorade was always first, and always in green cups. Water was always second, and always in red cups. The volunteers handing out the cups were awesome. Markers on the course identified each aid station well in advance so you could take a last second GU or do any other type of prep you need. There were also several places on the course where they were handing out bananas which is a nice touch. Due to the heat, most aid stations had volunteers spraying runners with water, and there were two places on the course where they handed out cold-water sponges. Every mile has elevated markers on both sides of the course that are equipped with split-time clocks. These are very easy to see even with the large number of runners. The crowd support is fantastic with approximately 1.7 million spectators. In many areas the crowd noise is almost overwhelming, but this really gets you pumped up. Each of the neighborhoods on the course has their own distinctive flair, and this brings a lot to the race. I know from my friends who’ve run Boston or New York, that crowd support is even better in those races, but the fans in Chicago are still awesome! The starting area was divided into seeded and open corrals, but there is not a wave start. With 45,000 registered participants there was significant congestion for the first few miles, even from a seeded corral. The finish area was well laid out with PLENTY of room to keep moving, stretch, etc. It was also a nice touch to hear the announcer say my name as I was powering to the finish line. The finish area included bottled water, Gatorade, Gatorade G3 recovery drink (which is nasty BTW), bananas, pretzels, Clif bars, cookies, etc. The other thing they had were large bags of ice which was awesome on such a hot day. I immediately took the ice and placed it on the back of my neck to cool down. This truly is a world class event in almost every way. I occasionally hear people complain about certain things at Chicago, mostly related to the number of participants. My thoughts are…If you don’t want a lot of participants and course congestion, find a smaller race. I for one enjoy the opportunity to participate in such a HUGE event. 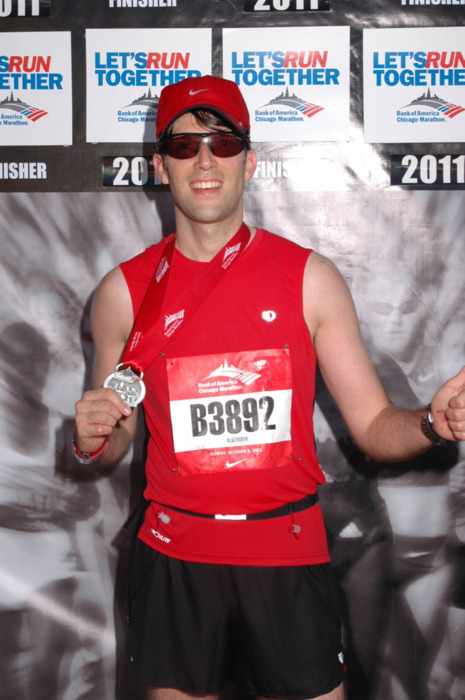 This race will also always be special to me because it was the site of my first full marathon. The Course: In a word … FLAT. The only “hills” on the entire course are on the various bridges throughout. However, most of these are insignificant except for the very last one going into Grant Park at mile 26. There are some long stretches without any turns which can be daunting. However, the incredible crowd support helps to make this less noticeable. The course starts and finishes on Columbus Avenue inside of Grant park. It contains a 3-miles section in the downtown Loop, a Northern loop, Western loop, and Southern loop. It goes through many, many neighborhoods all of which have their own characteristics and flair. 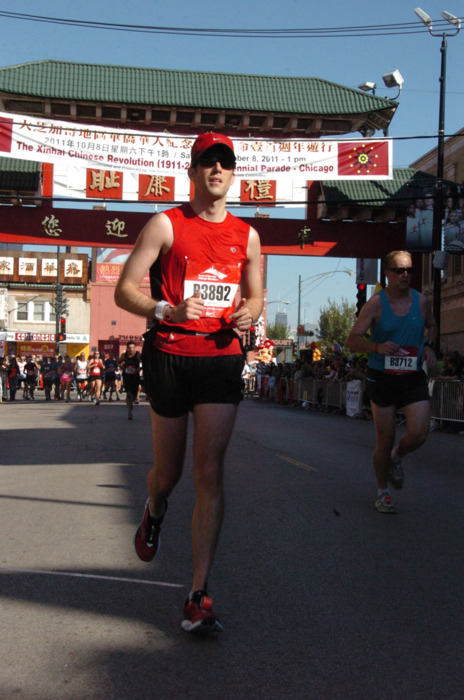 I especially enjoy running downtown, in Little Village, and in Chinatown.